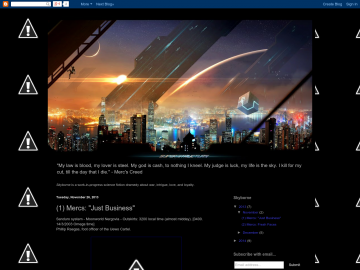 Muse's Success » Web Fiction Listings » Mercs, Feds, and Tribals. "We're a freelance merc crew that flies from bounty to contract to heist on the Skylark. Get your hands dirty and I'll give you a bunk, a home, and an even cut from all profits. - Chief, head of the 'Skylark' mercenary crew"
"Mercs, Feds, and Tribals" is a story about a third world caught in the throes of a civil war told through the eyes of those within it. The narrative shifts from the POV's of a seasoned mercenary crew seeking to make a buck, exhausted Federation crewmen and soldiers, to Tribal leaders who are just trying to keep their people alive. Mercs, Feds, and Tribals. has not been reviewed yet. Mercs, Feds, and Tribals. has not been recommended yet.